This joint of beef is one of the cheapest you can get from your butcher, and I promise, if properly hung, you will never be disappointed. 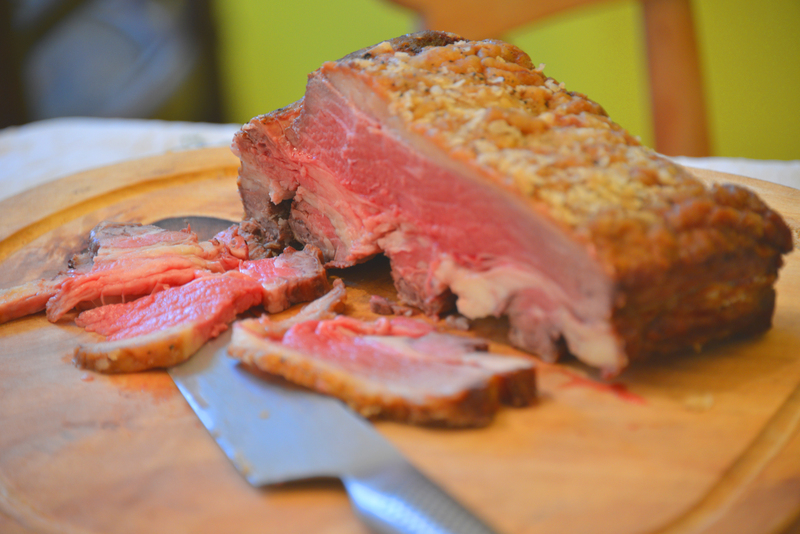 Usually costing less than £10 per kg, this joint is called a rib buster because, while roasting in your oven, it will expand rather than contract (like most joints do) and is REALLY great eating. Take a 1kg joint. This will easily feed four (with leftovers for sandwiches the next day) or 6 (and you can kiss any next-day snacking goodbye). Season the joint with a rub of flour, salt and pepper. Seal any cut ends on a hot frying pan, until brown. Then lay on a roasting tray and pop in a hot oven at 220c, 428f, or the centre of the top oven of an AGA for 1 hour. Once done, remove and leave for 20 minutes. While the meat is resting, boil a pan of water, and add to that Chanterelle carrots and new-season broccoli, for about 10 minutes. While they are cooking, make a quick gravy with the juices from the beef by adding a glass of good red wine and two tablespoons of crabapple jelly. Keep stirring on the heat until the gravy has reduced, season, and feel free to add a teaspoon of cornflour if you’d like it thicker.